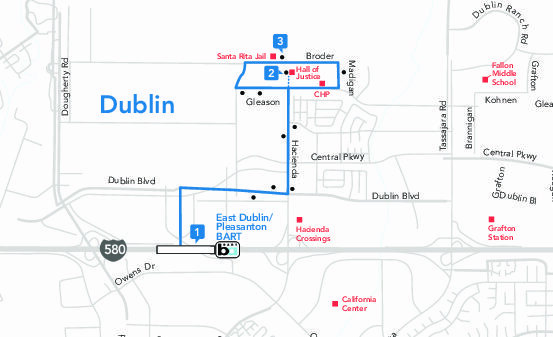 Route 1 operates as a local connector between East Dublin/Pleasanton BART to Emerald Point, the East County Hall of Justice and the Santa Rita Jail via Hacienda Drive. Route 1 operates every 30 minutes during peak periods, and every 60 minutes midday, evening and on weekends. No service to East County Hall of Justice on weekends.